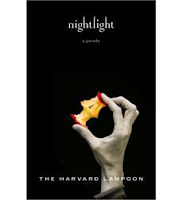 In one of the many parodies of Twilight, Nightlight chronicles the attempts of Belle Goose, an addle-brained teenager with a thing for vampires, to woo nerdy fellow-classmate Edwart, whom she’s certain is a creature of the night (he saves her from a flying snowball! She catches him eating Twizzlers! (They look a lot like blood if you kind of glance at them from the corner of your eye.)) When she realizes that Edwart is, in fact, NOT a vampire, she quickly dumps him for a bloodsucker she meets in a graveyard. She soon finds herself missing Edwart’s nerdy charms when she realizes that dating a vampire is not all it’s cracked up to be. A silly parody with a few laughs and a surprisingly sweet ending, it unfortunately lasts a hundred pages longer than it should be. Recommended for Ages 13-Up.